Pancakes and Lingerie go together like....nothing. But they're two things I'm thinking about this week! Lingerie. Pretty. Under $35. YES. Presenting something I just found out about - JCPenney's collab with Cosabella! Did you know it's Pancake Month?? We did here in NY - only because THE BEST PANCAKES EVER are made here at Clinton St Baking Co. Don't believe me? Then try to go by there on a Saturday or Sunday and see if your wait is less than 3 hours. 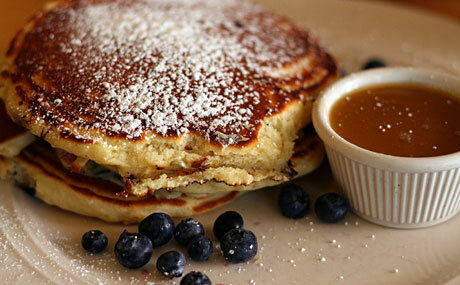 I love their pancakes because they're super cake-like with a gorgeous maple butter. And you can now get the recipes from their excellent cookbook - although I still prefer to go for the experience. Below is the Banana Pancakes Recipe from their book for those of you who can't make it to NY - or don't want to wait 3 hours! 1. Measure and sift all the dry ingredients into a large (preferably stainless steel) mixing bowl: flour, baking powder, sugar, salt. 2. In another bowl, whisk together the yolks, milk, melted butter, and vanilla until combined. Whisk the wet mixture into the dry mixture. The result should be slightly lumpy, yet combined to form a batter. 3. Whip the egg whites in a medium mixing bowl until they reach medium peaks (soft in the middle). You can either whip them by hand with a whisk, or put them in the bowl of an electric mixer to whip. Be careful, you don’t want to overwhip the egg whites. 5. Heat a griddle — either an electric griddle, a stovetop griddle, or a big flat pan — to 350 to 375°F. Grease the hot griddle with the remaining butter. Drop a cup (approximately 4 tablespoons) of pancake batter on the griddle and cook to set. When you see bubbles start to form on top, lift the pancake halfway up to see if it’s golden brown and crispy on the edges. If ready, flip the pancake. 6. When the pancake is golden brown on both sides, remove with a spatula. Repeat with the remaining batter and filling, cooking several pancakes at a time. 1. Melt the chocolate, corn syrup, half-and-half, butter, vanilla, chili powder, and cinnamon together in a stainless-steel bowl over a pot filled with warm water on low heat. Mix until smooth. Keep warm until ready to serve. 2. In a large bowl, mix together the flour, cornstarch, baking powder, cinnamon, and salt with a whisk. Continue whisking as you slowly pour in the seltzer. Set aside. 3. Fill a Dutch oven halfway with oil. Heat the oil to 350°F, checking the temperature with a cooking thermometer. Roll the banana halves in the batter and place them on a dish. With tongs, dip a banana tip into the oil and hold firm until the oil begins to bubble. Gently drop the banana half into the oil. Fry 2 banana halves at a time for 2 to 3 minutes, or until the bananas turn golden brown and crisp. Use a slotted spoon or skimmer to agitate the bananas every 30 seconds so they do not burn on one side. Repeat with the remaining bananas. 4. Place the fried bananas on a paper-towel-lined plate. Slice the bananas on the bias into 1-inch pieces and sprinkle them with cinnamon sugar. Serve the slices on top of the pancakes with the Cinnamon Chili Chocolate Sauce.